Shaped as a cross with a circle/loop for the top part, the ankh is the most commonly used symbol among the ancient Egyptian symbols. Many Egyptian gods, Isis in particular, were depicted holding the ankh in numerous inscriptions. Also known as crux ansata, which means “the cross with a handle” in Latin, the ankh symbol is an ideograph of ancient Egyptian culture. “What is an ideograph?” you are asking. An ideograph/ideogram is a graphic symbol that is used to represent a concept or an idea notwithstanding any conditions like the context of a language. 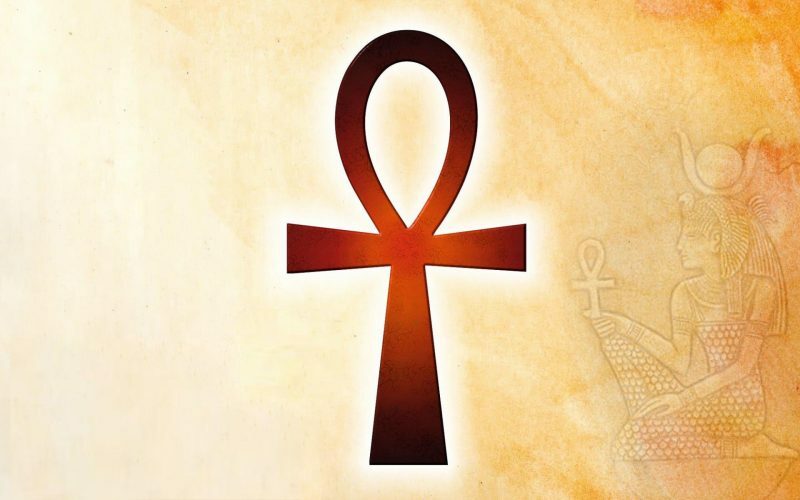 The Ankh: Meaning – What Does It Symbolize? 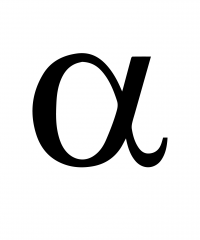 Although there have been many theories regarding the transformation of the symbol throughout the centuries and its exact origin could not be determined, the meaning of the ankh symbol is very clear. It means “life”. However, the ankh meaning “life” was simply not the only context Egyptians made use of the symbol. Here is a detailed look at various meanings attributed to it. 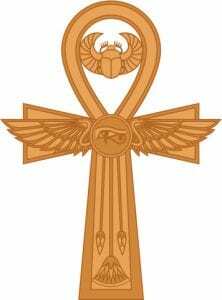 The ankh represents the union of man and woman and symbolizes the creation of life through this union. According to one of the theories regarding the origin of the ankh, the symbol might be the combination of the male and female symbols representing Osiris and Isis, the cross and the oval, respectively. It was believed that the union of Osiris and Isis flooded the Nile every year and gave Egypt life by providing fertility. 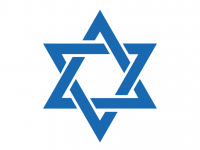 That is why the symbol is also known as “the Key of the Nile” and this is also the reason it is considered to represent the union of heaven and earth. 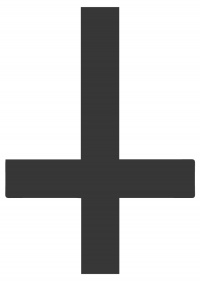 The horizontal part of the cross represents the division between the heaven and earth while the vertical part is considered to represent the two-way communication between these two realms. In some of the ancient Egyptian hieroglyphs, the king was depicted as if he was being fed little ankhs in a way that it could be inpterpreted as “breathing life into the king”. That being said, some hieroglyphs feature the king and two gods washing him over with a stream of little ankhs. Within this context, the ankh symbol represents the purifying power of the water although some experts suggest that the king in the inscription is washed to regenerate his life. Placed between the eyes of an initiate, the ankh means that the initiate now has the power of clairvoyance and can see “the world beyond”. Therefore, it is also considered as the lock on his mind to make him aware of his duty to keep secret these superior powers and the knowledge of the mystery he now has. 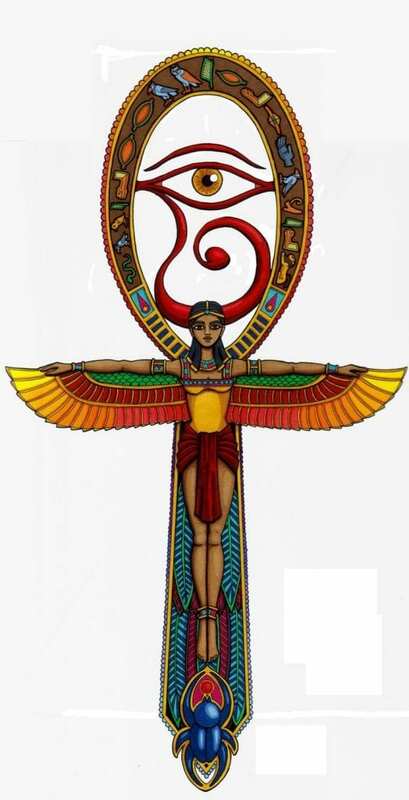 Egyptian gods (Isis in particular) are depicted holding the ankh in the hieroglyphs of the time. 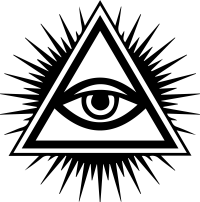 This represents that they are immortal and they are the ones controlling life and death. Therefore, it was believed that the deceased should have had the ankh on themselves while they were on the Boat of the Sun God or while their souls were being weighed – to show that they were seeking the immortality their gods had. The ankh was also considered as the key to the tomb which leads to the realm of eternity, the Fields of Aalu. On a side note, the word “ankhu” was used to refer to the dead while the word “neb-ankh” (meaning “the possessor of life”) was used to refer to sarcophagi. Drawn on the walls of the temples, the ankh symbol is believed to provide divine protection for the dead. When it was placed on the mummies, the ankh symbolized the numerous reincarnations these souls would have to go through until they gain immortality and become god-like entities. Having said that, the polytheistic ancient Egyptian religion is not the only religion that uses the ankh. Many centuries later, the ankh symbol was adopted by the Christian Coptic church and has been used as the symbol of life after death since then. This kind of ankh is named crux ansata or the Coptic ankh. The Ankh was a symbol used to represent learning or teaching. When the circle was held this meant learning (open minded and any subject can be discussed), when the other end was held this meant (someone is trying to teach something and you should listen).